Kindness and compassion are qualities all parents hope to instill in their kids. But achieving this goal requires more than simply asking your child to do nice things for other people. In fact, authentically kind people are motivated by feelings of empathy. They can see things from another person's perspective and understand how they might be feeling. They also can anticipate what might make a person feel better. When they can do these things, they are truly empathetic. Empathy is the central component of emotional intelligence. And if taught correctly, empathy can go a long way in preventing bullying. What’s more, studies show that kids who are empathetic have better relationships and perform better in school. Here are seven ways you can teach your child to be empathetic. It is very difficult for children to treat others kindly if they do not feel loved. One of the reasons that kids bully others is that they either don’t feel good about themselves or they are envious of others. Parents cannot expect their kids to be loving and kind if they are not being treated with love and kindness. This is especially true for victims of bullying or victims of sibling bullying. Even well-meaning parents make mistakes when it comes to a child's emotional needs. For instance, demanding perfect grades, expecting athletic excellence or even pushing your child to be popular can make a child feel inadequate and lead to bullying behavior. Instead, celebrate who your child is, his hard work and his accomplishments and work to guide him toward better behaviors. Also strive to impart resilience, self-esteem, social skills and assertiveness. When kids understand how they feel and can name their feelings, they are better equipped to identify similar feelings in other people. Also allow your kids the opportunity to express their feelings, even the negative ones. For instance, encourage your child to tell you when he is angry, sad or frustrated and engage him in a conversation. The goal is that your child learns to communicate his feelings in a healthy way without tantrums, violence or bullying. Teaching kids to look at a situation and understand how it might be experienced from another person’s point of view is an important life skill. For instance, ask your child how pushing a shopping cart might be more challenging for a senior citizen? What about for a mom of three? Kids who are skilled at seeing other perspectives tend to have higher emotional intelligence. They also tend to be more successful because they are able to examine problems from all points of view. This skill is also beneficial in bullying prevention. Kids who can look at things from a different perspective might better understand how the special needs student, the gifted student, and the food-allergic student feels in different situations. What’s more, each of these student groups are frequently bullied. But if kids are able to understand life from their perspective, they are less likely to target them. Talk to your kids about how another person might be feeling and why responded the way that you did. For instance, why did you cook dinner for your neighbor or clean your parents’ home? Be sure your kids see you doing these things and that they know why you are doing them. Look for everyday examples too. Whether it is a television program, a story in a book or a real-life situation, talk to your kids about how another person might be feeling in any given scenario. Then, engage your kids by asking for their thoughts and opinions. When kids are able to recognize situations where others might be feeling sad or hurt, they will be better equipped to know what to do when they witness bullying. They also will be less likely to engage in hurtful behaviors like relational aggression, name-calling, and mean girl behaviors. Research shows that kids are more likely to feel empathetic toward someone if they can relate with how a person might be feeling. So if your kids have lost a grandparent or a pet, they might be more empathetic toward a classmate going through a similar situation. Likewise, if your child has been bullied or cyberbullied, they are more likely to know how another victim might feel. There is a sense of empowerment that comes when kids can turn something that happened to them into something positive. Knowing how someone else might feel in any given situation is what being empathetic is all about. Look for opportunities to discuss how another person might be feeling. While it is important to share your thoughts, allow your child to talk too. 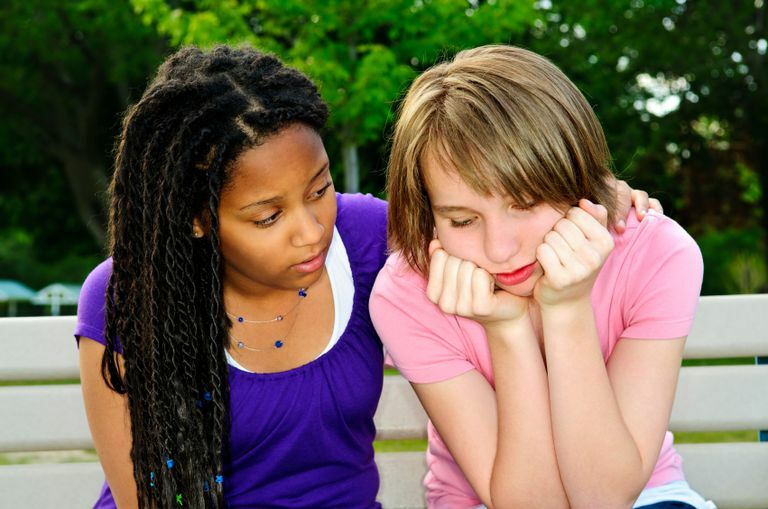 Ask open-ended questions like, “What did you see?” and “What would you want someone to do if you were in that situation?” When kids take the time to stop and think about how something might make another person feel, they are more likely to take a stand or get help for someone who is being bullied. Whether your child is a bully, spreads rumors and gossip, or just struggles to be kind, it is important that you talk about the consequences of his behavior. It’s also important to encourage your child to consider others before making decisions. Even something as simple as posting a picture to social media can impact others in ways your child may not realize. For instance, your child may post pictures from a party without realizing that friends who weren’t invited to the party might be hurt. Remember, being empathetic or having a high emotional intelligence, is much more than just being nice. Empathetic children understand their feelings and use them to make decisions. They also understand others, can manage stress and relate well to others. In the end, imparting empathy, not only prevents bullying but also prepares kids for success in life.